Following on from the recent golfer key and colour coding update, I am pleased to announce a major update to the 'Compare Predictions' pages (main and tee-off groups versions) on Golf Predictor. In addition to the stats that were already on the page, you can now directly compare more comprehensive season, last five tournament, course, tournament and last twelve similar tournament history stats. These new options are selectable from the new "Stats to Compare" dropdown list and basically offer the same functionality as the first five options on the Form menu, but just for the golfers of your choosing (up to ten on the main Compare page) or for the members of the selected tee-off group (tee-off groups version). In addition, you can now also directly compare the DFS, performance likelihood percentage (PL(%)), cut streak and winless streak stats on these updated Compare pages. This can be seen in the screenshot above for the 2015 WGC - Bridgestone Invitational, which shows the new stats dropdown list and the new DFS/PL(%)/streak stats for Jordan Spieth, Dustin Johnson and Henrik Stenson. As usual, you can hover over the golfer name for more information, as also shown above for Henrik Stenson. All these new stats are colour coded to highlight the best and the worst in each column, in keeping with the previous update to these pages. This new functionality should be a great help for deciding between a number of golfers for your fantasy golf, DFS line-up or betting needs. Season standard deviation (of average finishing position) comparison chart for all selected golfers. Season rounds played comparison chart for all selected golfers. Season voids (non-finishes) comparison chart for all selected golfers. Course standard deviation (of average finishing position) comparison chart for all selected golfers. Course rounds played comparison chart for all selected golfers. Course scoring average comparison chart for all selected golfers. Course tournaments played comparison chart for all selected golfers. Course top tens comparison chart for all selected golfers. Course wins comparison chart for all selected golfers. Course missed cuts comparison chart for all selected golfers. Course voids (non-finishes) comparison chart for all selected golfers. Tournament standard deviation (of average finishing position) comparison chart for all selected golfers. Tournament rounds played comparison chart for all selected golfers. Tournament scoring average comparison chart for all selected golfers. Tournament tournaments played comparison chart for all selected golfers. Tournament top tens comparison chart for all selected golfers. Tournament wins comparison chart for all selected golfers. Tournament missed cuts comparison chart for all selected golfers. Tournament voids (non-finishes) comparison chart for all selected golfers. Similar tournament standard deviation (of average finishing position) comparison chart for all selected golfers. Similar tournament rounds played comparison chart for all selected golfers. Similar tournament scoring average comparison chart for all selected golfers. Similar tournament tournaments played comparison chart for all selected golfers. Similar tournament top tens comparison chart for all selected golfers. Similar tournament wins comparison chart for all selected golfers. Similar tournament missed cuts comparison chart for all selected golfers. Similar tournament voids (non-finishes) comparison chart for all selected golfers. Season last 5 events standard deviation (of average finishing position) comparison chart for all selected golfers. Season last 5 events tournaments played comparison chart for all selected golfers. Season last 5 events top tens comparison chart for all selected golfers. Season last 5 events wins comparison chart for all selected golfers. Season last 5 events missed cuts comparison chart for all selected golfers. Season last 5 events voids (non-finishes) comparison chart for all selected golfers. Performance Likelihood comparison chart for all selected golfers. Cut Streak comparison chart for all selected golfers. Winless Streak comparison chart for all selected golfers. DFS (DraftKings) rank comparison chart for all selected golfers. DFS (DraftKings) salary comparison chart for all selected golfers. DFS (DraftKings) average points/game comparison chart for all selected golfers. DFS (DraftKings) dollars/point comparison chart for all selected golfers. The new 'Stats to Compare' dropdown list doesn't auto reload the page when a new option is selected. 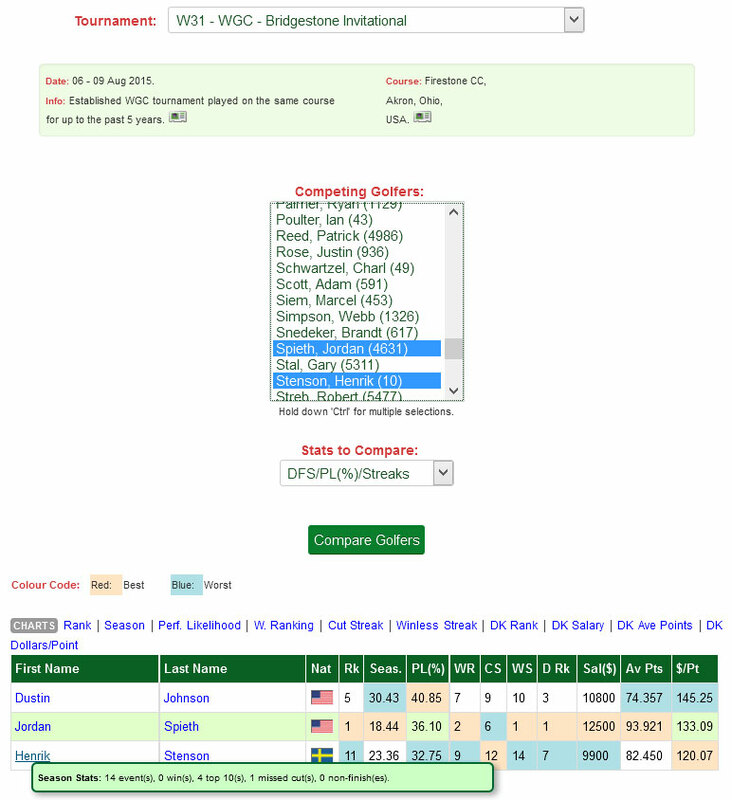 Simply select the golfers of interest (main Compare page) and the stats to compare from the new dropdown list and press the 'Compare Golfers' button to see the stats and chart links (charts only appear if more than one golfer selected). A 'Compare Golfers' button has been added and the auto reload feature has been removed from the 'Tee-off Groups' dropdown list on the tee-off groups version of the page to allow you to select a value from this new 'Stats to Compare' dropdown list. The stats that were on the original Compare Predictions page are still available via the "Overview" option in the "Stats to Compare" dropdown list. The highlighting of zero values for the historical stats options has changed from that for the Overview (original page). The wins, top tens, missed cuts and non-finishes columns will be appropriately highlighted if all golfers have zero for this column. In addition to above, if the golfer has no relevant history, the only column that is colour coded is the Rank column. 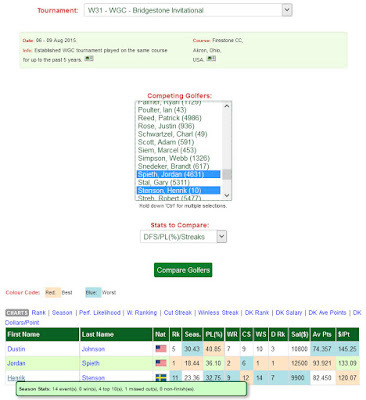 Some golfer comparison charts are not available for older tournaments. The charts are only available from when the stat was introduced to Golf Predictor. This will be told to you if you click on such a chart link for an older tournament. A lot of work has gone into this new comparison functionality and much testing had to be done on the large amount of new stats and charts added to the pages. If you spot any errors with this new functionality, please contact me immediately. Note that you must be subscribed to Golf Predictor to access these stats for all golfers in the field and to view all the charts. Non subscribers will only be able to see the data for those golfers ranked 11-25 and only 1 of the now whopping 57 charts available on this page. So, sign up today to make the most out of this comprehensive update to the compare functionality on Golf Predictor, the best professional golf stats site on the web!